Thousands of fish have been dying in Lake St. Clair in what government officials in Michigan are attributing to the largest spread since 2006 of a highly contagious virus. Known as viral hemorrhagic septicemia virus (VHSv), it does not pose a risk to human health but has been taking its toll this spring on different fish species in the lake - primarily gizzard shad. Other dead fish found infected in much smaller numbers include bluegill, largemouth bass and muskellunge, said Gary Whelan, research program manager for the Michigan Department of Natural Resources Fisheries Division, which this week issued a public alert. The virus has been found in the Great Lakes since around 2003 with the last noteworthy area outbreak occurring 11 years ago in the St. Clair-Detroit River corridor, he said. 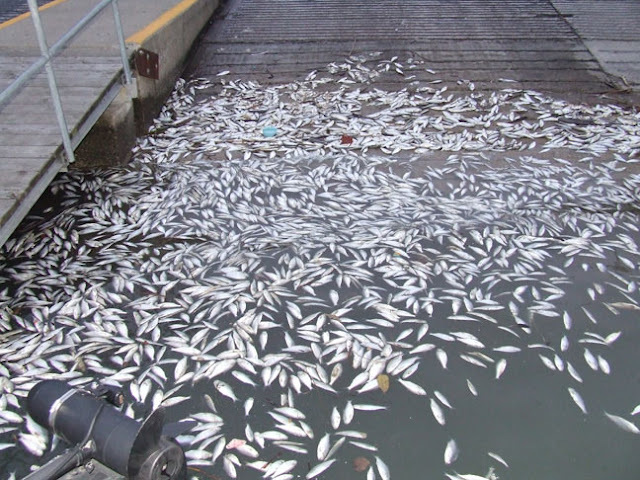 Early testing of dead fish has shown "very likely VHSv is involved," Whelan said. The virus makes the fish's blood vessels leak. It causes telltale bloody patches, which are a common sign of fish infections, so testing helps confirm whether VHSv is the culprit. The fear in Michigan is the highly contagious virus will spread more rapidly than in the past to fish other than gizzard shad. There are also concerns anglers on the water may unknowingly transport the fish virus farther downstream into the Detroit River and Lake Erie. Anglers are being reminded not to move live fish between water bodies and to properly dispose of bait, Whelan said. There were several citizen reports of large fish die-offs received this spring, including one from the Canadian side in Lakeshore, he said. There have been concerns about the potential for VHSv on the Canadian side, but no reports so far this year in the Windsor region, said Jolanta Kowalksi, spokeswoman for Ontario's Ministry of Natural Resources and Forestry. "We had reports for Lake Huron and the St. Clair River in late March," she said. "We collected gizzard shad from Inverhuron Park for testing on March 20. Our preliminary reports showed (the shad) tested negative for VHSv." Further testing is still underway, but full results will not be known for a few weeks, Kowalksi said. "Even with lab tests many times the cause of death we will never know," she said. Dave Beyer, of Windsor, was among a group of about a half-dozen who were fishing Thursday in the Detroit River close to the downtown. He was unconcerned about the virus, despite seeing "one or two" dead fish showing bloody virus symptoms recently while fishing in Little River. In February this year just up the road from Lake St. Clair tens of thousands of American gizzard shad were found floating belly up, dead, in Little River Canada, but the grave looking pool of dead fish is just another sign all is not well with American and Canadian water ways and the many species who inhabit these waters. Apparently millions of these little fish are migrating too far north due to climate change and can't handle fluctuations in water temperature. Typically, shad do not swim further north than New York, but in recent years, they have been swimming as far as Canada and quickly dying, according to the Essex Region Conservation Authority. "We've seen it happen quite commonly over the last 15 years, every two years or so depending on the thaw," said Tim Byrne, ERCA's director of watershed management services. The problem is shad are highly prone to thermal shock, which is a sudden change in water temperature that immediately kills schools of fish, reports CBC News.